JONATHAN’S MISSION: to bring Modern American Glamour to your life. How? By creating a foundation of timelessly chic furniture and accessorizing with abandon. Jonathan started teaching classes at Mud, Sweat ‘n’ Tears in New York City in exchange for free studio space. After successfully cold-calling the buyers from Barneys New York he dove into production—rollerblading to the studio at 6 a.m., making a hundred mugs, and coming home to fall asleep. Eventually he partnered with Aid to Artisans, a non-profit rganization devoted to helping crafstpeople in developing countries by connecting them with designers in America. While in Peru, he fell in love with South American textiles and started designing pillows, throws, and rugs. He fused his modern sensibility with the soulful work of the people of Peru. Jonathan opened his first store in Soho in 1998. Figuring “why stop at pots,” he partnered with his Peruvian pals on throw pillows, and then started imagining the sofas those pillows could sit on. 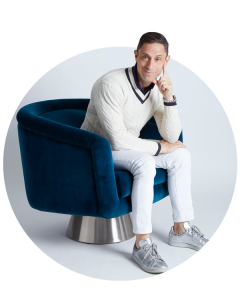 Soon enough he was in the home décor biz—working with artisans of all kinds to craft everything from swanky side tables to divine dinnerware to custom upholstery. He took his signature style out of the store too, tackling interior design projects for private residences, restaurants, and hotels, including the beloved desert destination, The Parker Palm Springs Hotel, and the Eau Palm Beach Resort and Spa. ce sits between a giant kiln and a working pottery studio. WE BELIEVE in our muses: David Hicks, Alexander Girard, Bonnie Cashin, Hans Coper, Gio Ponti, Andy Warhol, Leroy Neiman, Yves Saint Laurent, and Madonna. WE BELIEVE our lighting will make you look younger and thinner. WE BELIEVE in highbrow books and lowbrow music. WE BELIEVE in the three Ls: layer, layer, layer. WE BELIEVE subversive is superior. 1966 -Born in farm town in New Jersey. 1978 -Tries pottery at summer camp while wearing a Rush concert tee. 1980-84 -Spends entire adolescence in basement of family’s modern house throwing pots. 1984-88 -Allegedly studies semiotics and art history at Brown but actually spends all his time at RISD making pots. 1989 -Makes quilted line of pottery inspired by Chanel. Evil professor advises him to bag a pottery and try a career in law. 1990 -Moves to New York and starts working in the movie business. 1993 -Deeply depressed from three years in the movie business (as anyone would be), quits. Tells parents he wants to be a potter and starts Jonathan Adler, the company—vows never to have a real job again. Concerned parents schedule an intervention. 1994 -Shows pots to Barneys and gets an order. Realizes he has to make the pots. 1997 -Realizing he’s but one man, hooks up with Aid to Artisans, a non-profit organization that connects artisans in developing countries with American designers. Flies to Peru and discovers paradise—a beautiful workshop by the sea with parrots, gardens, and incredible craftsfolk. Creative explosion ensues. 1998 -Opens his first store in Soho. 1999 -Adopts (with his partner Simon Doonan) a Norwich terrier named Liberace who is the light of their lives. 2000 -Millennium madness. Luckily Y2K has no impact on pottery wheels. 2004 -Designs The Parker Palm Springs hotel. Develops raging obsession with waspy country club style—needlepoint, chinoiserie, and acid green lacquer. Concerned Jewish mother schedules another intervention. 2005 -Writes first design book. Jewish mother proud, but Liberace remains aloof—he is, after all, a terrier. 2006 -Turns 40. Reluctantly relinquishes ingénue status. Needlepoint obsession now less ironic. 2007 -Joins the Bravo family as lead judge on Top Design. Wanders the streets in outfits borrowed from the show hoping to be recognized. 2009 -Tapped to design a real life Malibu Dream House to celebrate Barbie’s 50th. Can finally make amends for decapitating sister’s Barbie in 1974. 2012 -Opens his 20th store. Figure destroyed from local delicacies near each store location—scones and clotted cream in London taking the brunt of the blame. 2014 -Celebrates 20 years of empire building. Completes a redesign of the groovy Eau Palm Beach Resort & Spa. 2016 -Joins Fisher Price as Creative Director, providing a legitimate excuse to play with toys. Snuggles with his newly adopted mutt Foxylady (and occasionally Simon). The late, great Liberace smiles down from the big dog park in the sky. 2017 -Finds public sculpture appealing and creates a massive 7-foot-tall, 900-pound, bronze banana at The Parker Palm Springs.